Now you'll be prepared the next time that question comes up in class. 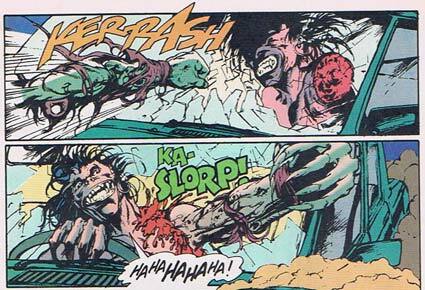 I had to wonder, however, why the vampire in question would want to reattach the arm, since it seems like having a detached limb capable of flying around independently with enough power to smash windshields might be an advantage in a fight. But I rarely battle the forces of evil any more, so what do I know? Of course, given the vampire's massive grin and hearty belly laugh, maybe an arm ka-slorping back into place just feels really, really good.